Minister Amir Peretz (Hatnua) spoke on the phone with Palestinian President Mahmoud Abbas and gave his regards for the holiday of Eid al-Fitr, which marks the end of Ramadan. Perez said he sees an important opportunity for a breakthrough towards the renewal of negotiations. 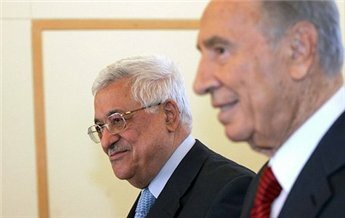 Peretz's office reported that Abbas declared that the Palestinians will make every effort in order to reach an agreement. The ministerial committee that was formed some two weeks ago to compose the list of prisoners who are to face release as part of an Israeli gesture as part of the resumption of negotiations, is to convene for the first time on Sunday, when the committee will finalize a list of prisoners to be released on Tuesday. The identity of the prisoners expected to be released remains unknown. US envoy Martin Indyk is scheduled to land in Israel on Sunday. During his visit, Indyk will hold talks with both sides ahead of formal negotiations. The criteria by which the ministers are to determine which of the prisoners can be released were set by the Shin Bet, which prioritized the names of the prisoners according to the amount of threat they pose to Israeli security. The Shin Bet lists will be presented to the ministerial committee on Sunday, and the names of the prisoners who are to be released will be published once the committee finalizes the list. The State is required by law to publish the names in the Israel Prison Service website 48 hours prior to the release of the prisoners. President Shimon Peres will most likely not be signing pardons, seeing as most of the security prisoners who will be released Tuesday will be Palestinians, in which case the release needs the approval of the IDF . If all goes according to plan, negotiation teams will reconvene on Wednesday. Ahead of Indyk's visit to the region, Prime Minister Benjamin Netanyahu sent a letter to US Secretary of State John Kerry Saturday night, in which he accused Palestinian President Mahmoud Abbas of incitement against Israel. PMO sources said that the letter mentioned quotes in which Abbas speaks against Israeli presence in the future Palestinian state, and additional quotes from the official Palestinian television broadcasts. "Incitement and peace cannot go hand in hand," Netanyahu wrote in the letter. In another letter to Kerry, the chief Palestinian negotiator Saeb Erekat said Thursday that Israel's intention to build 1,000 new homes in settlements was an indication of "Israel's bad faith and lack of seriousness" in the talks. Despite all Israel's declared settlement plans in the West Bank, the Palestinian Authority (PA) is still intent on sitting at the negotiating table once again with the Israelis next Wednesday after a first round of talks in Washington at the end of July. As announced by the US department of state, the second round of negotiations between the Israeli and Palestinian representatives will be held on the 14th of August in [the occupied cities] of Jerusalem and Jericho this time. Meanwhile, the US department of state condemned Israel for its persistent settlement activities in the West Bank despite the launch of the peace talks. It said that Israel's plan to build more than 800 housing units in the West Bank would undermine the efforts to create the atmosphere for the success of the second round of its negotiations with the Palestinians. A political analyst has denounced the planned resumption of talks between Israel and the Palestinian Authority (PA) as “meaningless theatrics” aimed at covering up Washington and Tel Aviv’s agenda in the region. “The so-called ‘peace talks’ initiated by [US Secretary of State] John Kerry between Israel and the Palestinian Authority are meaningless theatrics that are part of a stratagem concealing and obscuring the real intentions of the US and Israel in the Middle East,” said Mahdi Darius Nazemroaya in a Friday article titled “John Kerry’s Israeli-Palestinian talks are a cover for aggression and annexation” on Russia Today’s website. The idea of negotiations is used as a “convenient tool” to distract the international public opinion by portraying Israel as a “reasonable entity willing to make concessions for peace and security,” he added. While Israel has made no concessions in reality, the Palestinian side has been the only party which has been making the real compromises under pressures from Washington and Israel, the article pointed out. “Whatever the reasons are behind the renewal of the futile talks between Tel Aviv and the PA, the US government and Israel are not interested in a just resolution. Neither the talks nor the negotiators nor the US government, as a broker, are genuine,” the article read. “While the destitute Palestinian people undergo territorial disposition, the sham peace talks have served as nothing more than a smokescreen for Tel Aviv to systematically colonize what is left of the Palestinian homeland as Israeli Lebensraum or ‘living space’,”’ it added. On Thursday, US State Department spokeswoman Jen Psaki said talks between the PA and the Israeli regime will resume on August 14 in al-Quds (Jerusalem). On Sunday, hundreds of Palestinians took to the streets of Ramallah and began marching towards the PA Acting Chief Mahmoud Abbas' headquarters to protests against the planned resumption of talks with Israel. 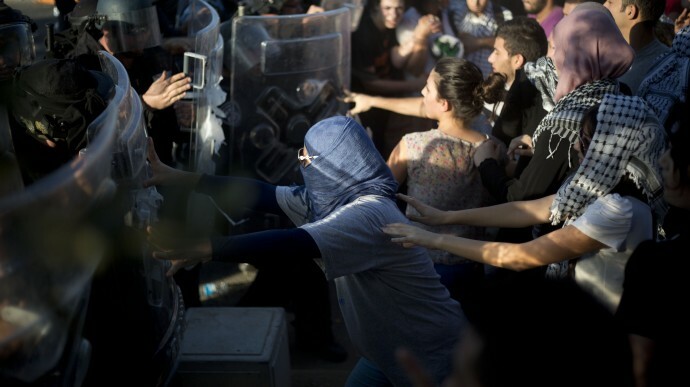 Several police officers and demonstrators were injured and some were arrested during the march organized by the Popular Front for the Liberation of Palestine. German Foreign Minister Guido Westerwelle will travel to Israel and the Palestinian territories in a bid to lend backing to revived peace talks, a ministry spokesman said Friday. Westerwelle will meet President Shimon Peres and the chief Israeli negotiator, Justice Minister Tzipi Livni, in Jerusalem on Sunday, followed by talks with Prime Minister Benjamin Netanyahu on Monday. 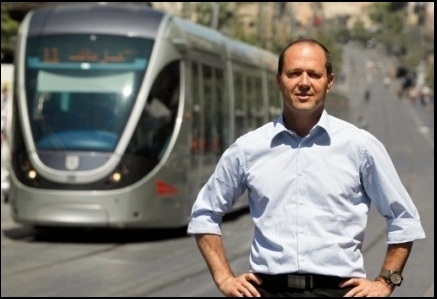 He will then sit down with President Mahmoud Abbas and PA Prime Minister Rami Hamdallah before returning to Berlin. "Foreign minister Westerwelle will express Germany's strong support for the resumption of talks under US mediation," the spokesman said in a statement. "Germany and Europe will do all they can to lend backing to the new peace talks so they may be successful." After three years of stalemate, talks between Palestinian and Israeli negotiators on ending their long-standing conflict began again last month in Washington under US mediation, and both sides agreed to try to resolve their differences within nine months. 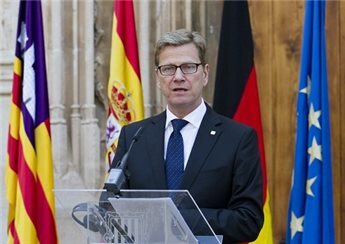 A foreign ministry spokesman had told reporters Wednesday that Westerwelle would only travel to the region if he felt he could make a "positive contribution to the peace process", calling the effort "very difficult". Secretary of State John Kerry and national security adviser Susan Rice met with Jewish community leaders at the White House on Thursday evening to update them on the resumption of talks and hear their concerns. Another meeting will be held Friday with leaders from the Arab-American community, Psaki said. According to people familiar with Thursday's meeting, Kerry outlined a five-track approach for the negotiations with the Israelis and Palestinians: security, economics, international outreach, public outreach, and direct talks between the parties. 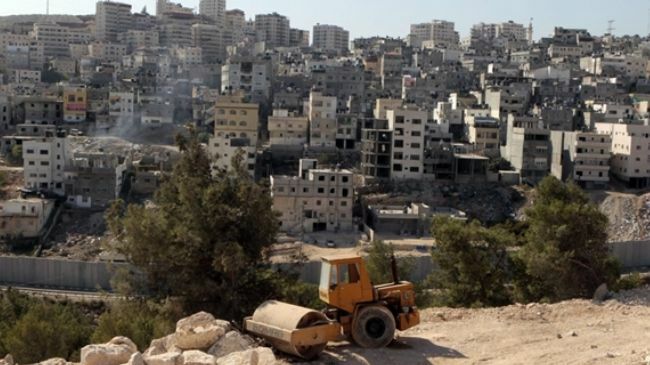 Chief Palestinian Authority negotiator Saeb Erekat has slammed the Israeli regime over its preliminary approval for the construction of more illegal settler units in the occupied West Bank. 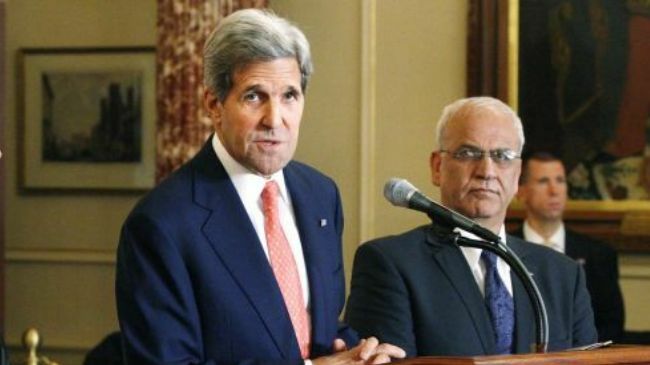 In a letter to US Secretary of State John Kerry on Thursday, Erekat said the Tel Aviv regime’s recent announcement indicates its “bad faith and lack of seriousness” in the US-backed talks between Palestinians and Israelis. On Thursday, Guy Inbar, spokesman for Israel’s military-run civil administration in the occupied West Bank, said initial plans to construct more than 800 new illegal settler homes had been approved. Hanan Ashrawi, a member of the Palestinian Liberation Organization’s executive committee, also urged Kerry on Thursday to take “real action” against the Israeli regime. Erekat sent the letter on the same day that US State Department spokeswoman Jen Psaki said talks between the Palestinian Authority (PA) and the Israeli regime will resume on August 14 in al-Quds (Jerusalem). 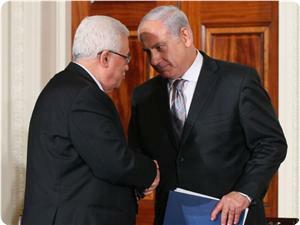 The representatives of Israel and the Palestinian Authority met in Washington in late July. The meeting was the first direct negotiations in three years. 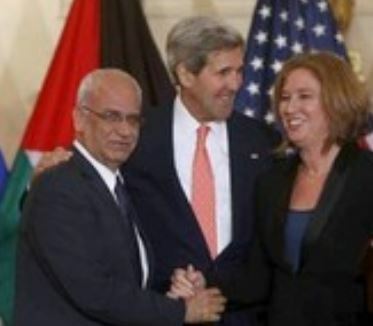 United Foreign Secretary, Jennifer Psaki, stated Thursday [August 8, 2013] that the next round of direct Palestinian-Israeli talks will be held on August 14 in Jerusalem, then in the West bank city of Jericho. Psaki stated that this second round of direct talks would be held under direct supervision of U.S. Special Middle East Envoy, Martin Indyk, and added that Secretary of State, John Kerry, will not be giving any statements after the meeting. Direct talks started under American mediation when Israeli Chief Negotiator, Tzipi Livni, met with her Palestinian counterpart, Dr. Saeb Erekat, on July 29 and 30. Kerry supervised the talks that started after he visited the region six times starting in March this year. The talks started with the intent to reach a final status agreement in nine months despite enormous obstacles that could topple them, including Israel’s ongoing invasions into Palestinian communities, and its ongoing assaults, in addition to its ongoing illegal settlements construction and expansion activities in the occupied West Bank, including in occupied East Jerusalem. Israel also refuses to hold talks on borders, natural resources and refuses to recognize the internationally guaranteed Right of Return of the Palestinian refugees. 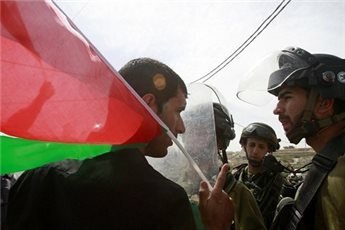 A Palestinian protester argues with Israeli troops at a demo against settlements in al-Massara. Israeli authorities have moved forward on giving final approval on plans to build nearly 1,000 new settler homes in the occupied West Bank, an official told AFP on Thursday. He said initial approval had been granted by Defense Minister Moshe Yaalon several months ago and plans were now being made public so that any objections could be raised before the process moves to the next stage. Israeli settlement watchdog Peace Now said the move applied to 920 new homes, while 166 units that had already been built without going through the necessary procedure were given the preliminary approval retroactively. 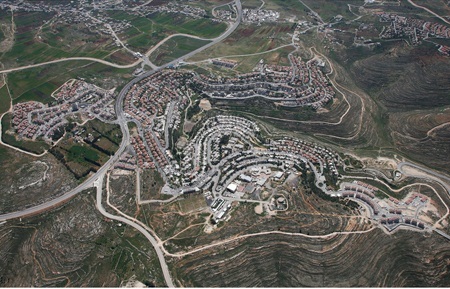 The total of 1,086 homes was spread across seven settlements, the NGO's Lior Amihai said. This comes as US-brokered preparatory talks are under way between Israel and the PLO on resuming direct peace negotiations that have been stalled for nearly three years. The PLO has demanded that Israel freeze settlement construction before returning to talks, but Israel has rejected any preconditions. Senior PLO official Hanan Ashrawi said on Thursday that settlement building was "the willful destruction of any chances of peace". "If the US really wants peace they have to intervene immediately and effectively," she told AFP. Peace Now's Amihai said the latest batch of approvals "showed the true intention of the government, putting a very heavy question mark on their intentions". Several analysis are linking the resumption of the peace talks with Prime Minister Netanyahu’s desire to legitimize a strike on Iranian nuclear facilities. Some even claim that the U.S. administration is in the loop. A week ago [July 30], after the painful decision to release more than 100 Palestinian prisoners, some of whom are “heavyweight” murderers, to resume negotiations with the Palestinians, Israel’s Defense Minister Moshe “Bogie” Ya’alon had something very interesting to say: Underlying the decision to release prisoners — he stated — “were strategic considerations, which might be revealed in the future.” (…) What will we understand in the future? In light of the intimations, the signals and the whispers, we are able to figure out the quiet deal that was cut between Israel and the United States: Israel will do whatever is necessary to start negotiations with the Palestinians, maybe even reach a type of an interim arrangement ahead of the final status arrangement. 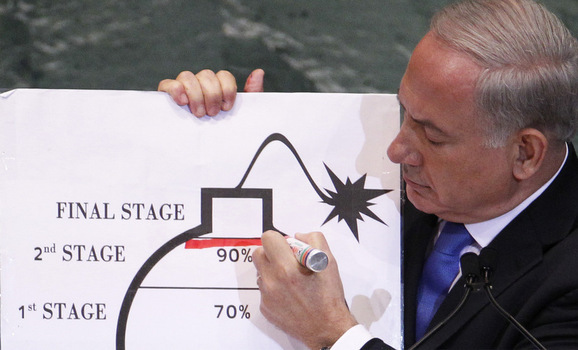 America will give Israel a green light to bomb Iran after having fully verified that the Iranians are really poised to make the final “charge” toward the bomb. At Haaretz, Sefi Rachlevsky and Alon Ben David raised the same idea – that the real reason Netanyahu entered the peace process is his desire to legitimize an attack on the Iranian nuclear facilities. Rechlevsky is an author and doesn’t have good sources (his article is not as much of a report as an analysis of Netanyahu’s character) but Alon Ben David is a veteran military correspondent. In previous weeks others have made similar suggestions (see Ynet’s military correspondent Ron Ben-Yishai). Reports are that the heads of Israel’s security forces remain in opposition to an attack, including Air Force commander Maj.-Gen. Amir Eshel. Gaza premier Ismail Haneyya has welcomed the release of Palestinian prisoners from Israeli jails on condition that the step would not be linked to concessions. Haneyya, addressing the Eid congregation on Thursday, expressed surprise at the return of PA to negotiations with the Israeli occupation authority (IOA) and warned it against offering concessions in those talks. He said that the negotiations process allowed the IOA to go ahead in its Judaization and settlement activity in the occupied Palestinian territories. Haneyya, also deputy political bureau chairman of Hamas, called on Egypt to re-open the Rafah border crossing before individuals and goods. He affirmed that his movement does not interfere in the internal affairs of Arab countries, adding that recent revelations (of secret Fatah documents) confirmed such trend and exposed those trying to smear the movement’s image. The premier underlined that the unlimited American military support for Israel would not succeed in ending its isolation in the region. Hamas Movement has called on PA and Fatah movement to cancel talks with the Israeli occupation authority that only “harm national reconciliation and betray the martyrs and holy sites”. Opting to the negotiations option instead of national unity is a moral and political crime, the movement's statement said, pointing to the continued Israeli Judaization schemes, arrest campaigns, deportation and demolition crimes against the unarmed Palestinian people. In its statement, Hamas renewed its total rejection to the PA decision to resume negotiation with the Israeli occupation that aims to compromise the Palestinian fundamental rights. Hamas held Fatah responsible for the serious outcomes of its decision, saying that talks resumption cannot meet with the national reconciliation and unity. The IOA tries to distract the attention of Palestinians away from the serious consequences of negotiations by releasing few dozens of Palestinian prisoners from Israeli jails, the statement added. Wafa al-Ahrar exchange deal was an example of sacrifice and victory over the occupation where 1000 prisoners were released according to the resistance's, not the Israeli, conditions, it said. The media campaign that accompanied the negotiation process was waged in order to cover the serious implications of the PA decision that will isolate the Gaza Strip, compromise Jerusalem and the right of return, in addition to West Bank settlement recognition, and surrendering the Jordan Valley. 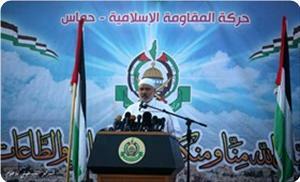 In other words it will liquidate the Palestinian cause, the statement continued. The movement called on the Palestinian people and the Arab world to stand firmly against this suspicious conspiracy that targets Jerusalem, Al-Aqsa mosque, and the Palestinian issue. Israel has given preliminary approval for the construction of more than 800 new homes in Jewish settlements on occupied West Bank land where Palestinians seek statehood, an Israeli official said on Thursday. The move could complicate US-sponsored Israeli-Palestinian peace negotiations, which resumed last month after an almost three-year freeze over the settlement dispute and whose second round is expected to take place next week. Guy Inbar, spokesman for Israel's military-run Civil Administration in the West Bank, said initial plans to build 800 new settler homes were approved on Wednesday, though actual construction would require a green light from the government. "This is a lengthy process," said Inbar, who did not immediately provide further details on the plans. Peace Now, an Israeli anti-settlement watchdog, put the number of new homes discussed by the Civil Administration on Wednesday at 1,096 and said they were earmarked for 11 settlements – some of them located deep within the West Bank. Israel insists it would annex major West Bank settlement blocs, which are mainly situated close to the Israeli border, under any peace accord with the Palestinians. Most world powers regard all the settlements as illegal and Palestinians say the enclaves could deny them a viable and contiguous state. Palestinian officials did not immediately comment on the new settlement initiative, which surfaced as Muslims celebrated the festival of Eid al-Fitr. Some 500,000 Israeli settlers live in the West Bank and east Jerusalem, areas captured in the 1967 War, amid 2.5 million Palestinians. Israel withdrew in 2005 from the Gaza Strip, which is now governed by Hamas Islamists opposed to permanent co-existence with the Jewish state. On Sunday, the rightist Israeli government put 91 settlements on a national priority funding list, adding six to a roster of dozens of enclaves already eligible for supplemental state cash. Last month, while US Secretary of State John Kerry was on a peace-brokering visit to the region, the Civil Administration granted initial approval for construction of 732 new homes in Modiin Ilit, a settlement midway between Jerusalem and Tel Aviv. 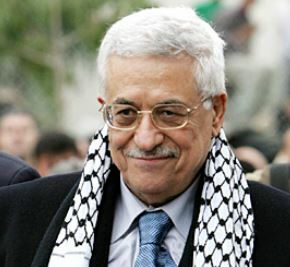 Palestinian President, Mahmoud Abbas, stated that direct political talks between Israel and the Palestinian Authority will start very soon, and added that the Palestinians will not abandon their legitimate rights, and their right to declare occupied Arab Jerusalem as the capital of their state. His statements came after her placed roses on the grave of late President, Yasser Arafat, as the Muslim nation started the Al-Fitir Holy Feast celebration, marking the end of the Holy Muslim month of Ramadan. The President said that this feast carries special joy to the Palestinian people, and all detainees who have been imprisoned before the year 1994, as they will be released from Israeli prisons soon. “God willing, the release will start very soon, and will be carried out on stages that are not far away from each other”, Abbas said, “We all exerted maximum efforts to secure their release, and now they will be freed, and we will continue to act on the release of all detainees”. “I hope that next feast will be celebrated under an independent and sovereign Palestinian State, with the Holy City of Jerusalem as its capital”, he stated, “We did not forget the file of national reconciliation and unity, we want to end all sorts of internal divisions”. The President added that the Palestinian Authority in the West Bank, and the Fateh movement, are ready to implement the Doha and Cairo national unity agreements. “Let’s hold elections, we are ready for that, and I hope every party is ready too”, he said. He added that internal divisions and conflicts are a disgrace, and stressed on the importance to finally achieve national unity, and comprehensive reconciliation. The Israeli Government has officially announced a timeframe for the release of 104 Palestinian detainees, imprisoned since before the first Oslo peace accord was signed in 1993, and said that the detainees will be released in four stages, starting next week, and ending in eight months of direct talks. The Radio added that the third and fourth stages would be implemented after the direct talks have continued for six and eight months, and that the release is solely dependent on the “progress of talks with the Palestinians”. Direct talks with Tel Aviv started recently following several years of stalemate due to ongoing Israeli violations topped by Israel’s illegal settlement construction and expansion activities in occupied Palestine, its ongoing invasions and assaults. 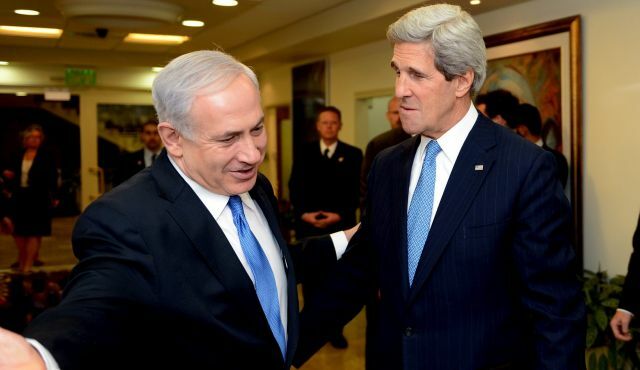 U.S. Secretary of State, John Kerry, managed to get the talks started “without preconditions”, and without an Israel commitment to completely stop its illegal settlement activities. Various Palestinian factions and groups, and the general public attitude in Palestine, rejected the move made by the P.A., and considered it a setback to the steadfastness of the Palestinian people. Originally, Israel was supposed to release the 104 political prisoners, those who spent 20 or more years in Israeli prisons, as a goodwill gesture from Tel Aviv to boost the prospects of direct talks, but Israel then decided not to release the detainees all at once. On its part, the Hamas movement said that the release of a few dozen of detainees under Israeli preconditions is an Israeli act meant to delude the public opinion, and the international community. Hamas added that, despite the joy of freedom, and the happiness it brings to every detainee and the Palestinian people; the Palestinians will not be deluded, and will never abandon their legitimate rights of real freedom, liberation and independence.